© 2002, © 2018 by Paul Freeman. Revised 11/17/18. 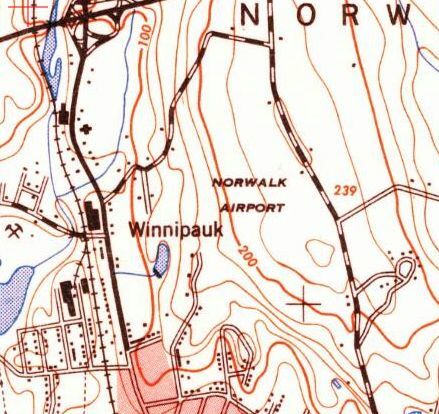 Norwalk Airport was depicted on the 1931 Air Navigation Map as an unlabeled auxiliary airfield (the read cross on the north side of Norwalk). as it was not yet depicted on a 1929 aerial photo (courtesy of Thomas Cossuto). According to Ray Jacobelli, “The Fodor's operated a machine shop during the 1920s. I met a relative several months ago who told me one of the Fodor's was interested in starting an aircraft manufacturing business. The flight of the Blackbird to Norwalk occurred prior to the stock market crash of 1929. 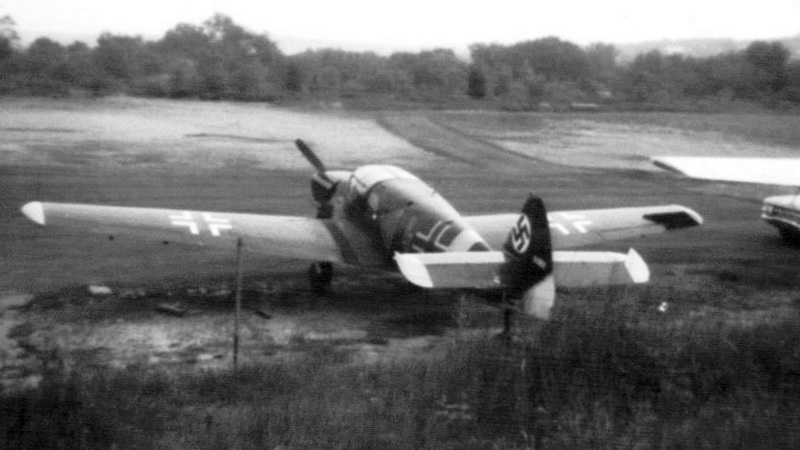 Fodor flew the airplane back east, landing at Norwalk Airport, but ground looped & damaged the airplane. which depicted an unlabeled auxiliary airfield on the north side of the town of Norwalk. The earliest dated photo which has been located of Norwalk Airport was a 1934 aerial view. 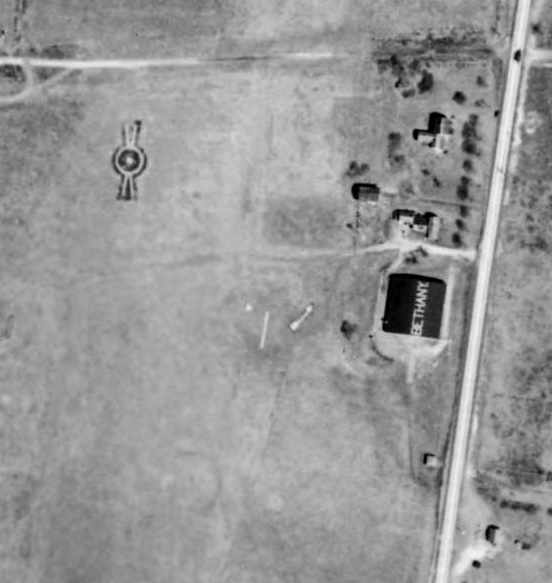 It depicted Norwalk as having a single hangar on the north side of a grass airfield. A northeast/southwest runway appeared to cross Rocks Road. 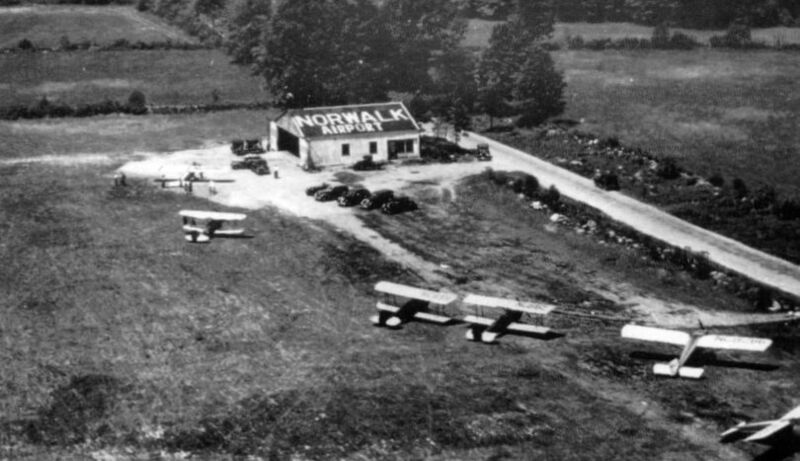 was a circa 1930s aerial view which depicted 6 single-engine aircraft next to a hangar labeled “Norwalk Airport”. which depicted Norwalk as a commercial/municipal airport. According to Ray Jacobelli, “On 12/12/38, 2nd Lt. Lawrence Spillman was piloting a North American BC-1 aircraft, (serial #38-379) on a training flight over CT when he encountered thick cloudy weather. rather than attempt to make it back to his home base of Mitchel Field on Long Island. As he came in to land at Norwalk Airport, the aircraft hit a patch of soft ground & flipped over on its back. Neither Lt. Spillman or his passenger, 2nd Lt. Leroy Stefonowicz, were injured. According to Ira Perelle, Norwalk Airport “was used as an aircraft spotter's post early in the WW II years (to watch for the arrival of enemy aircraft). I was in high school in those years, and volunteered as an aircraft spotter, which is how I learned of its existence. as it was no longer depicted on the March 1940 NY Sectional Chart (courtesy of Tim Zukas). which depicted Norwalk Airport as an open area with a few small buildings along the periphery. 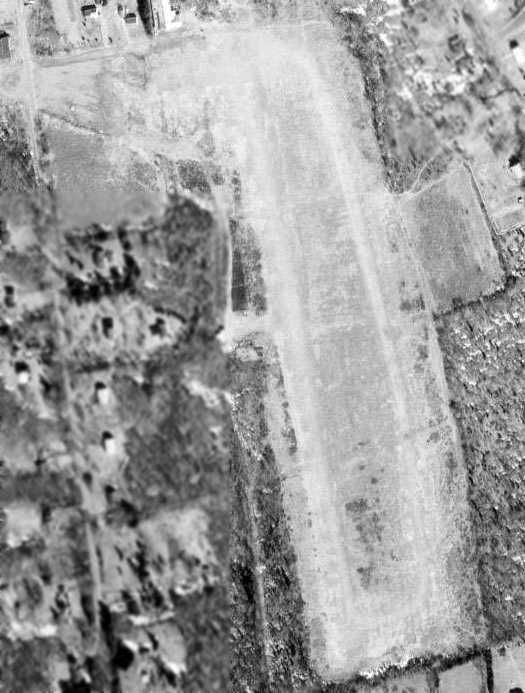 A 1951 aerial photo showed the remains of the Norwalk runway. Kevin Daly observed, “The runway no longer crossed the road to the east but was extended through a farm's stonewall to the west. 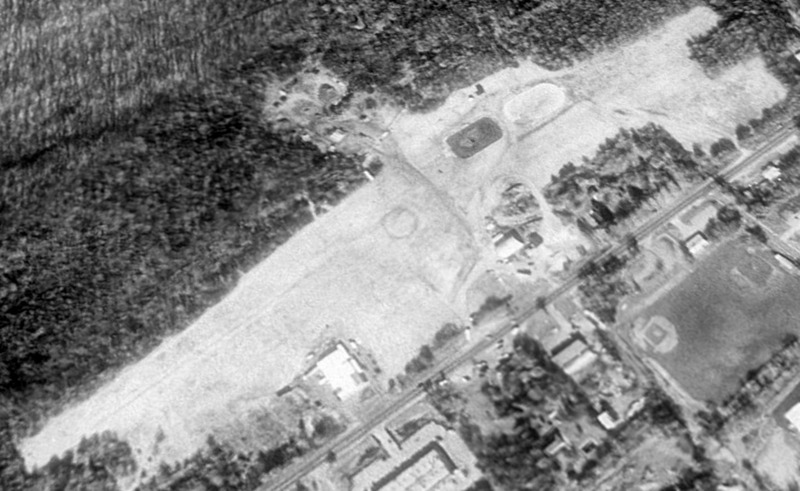 A 1960 aerial photo showed that the All Saints Catholic School had been built over the site of Norwalk Airport at some point between 1951-60. 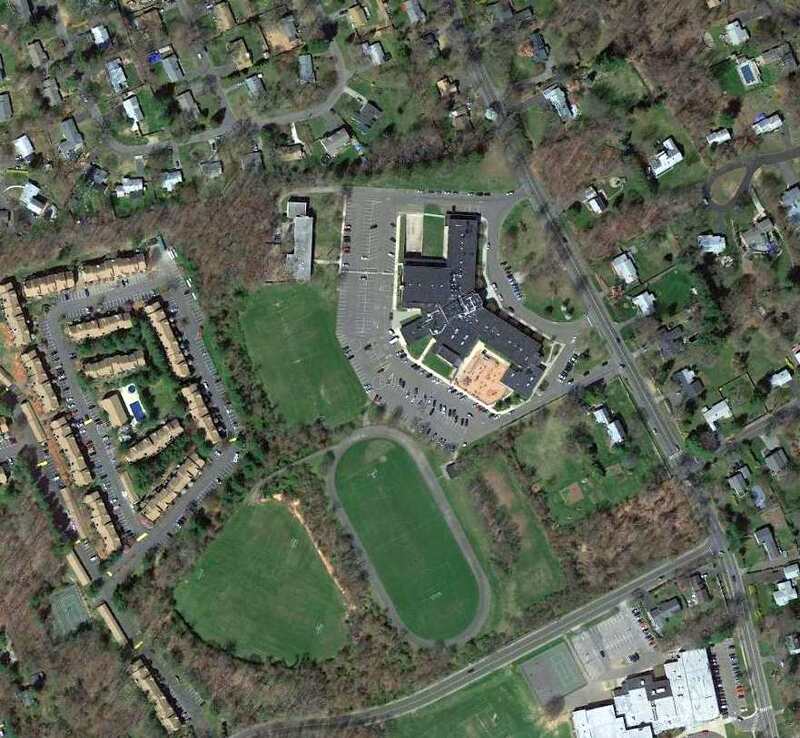 A 3/9/12 aerial view shows All Saints Catholic School covering the site of Norwalk Airport. The site of Norwalk Airport is located northwest of the intersection of Aiken Street & West Rocks Road. 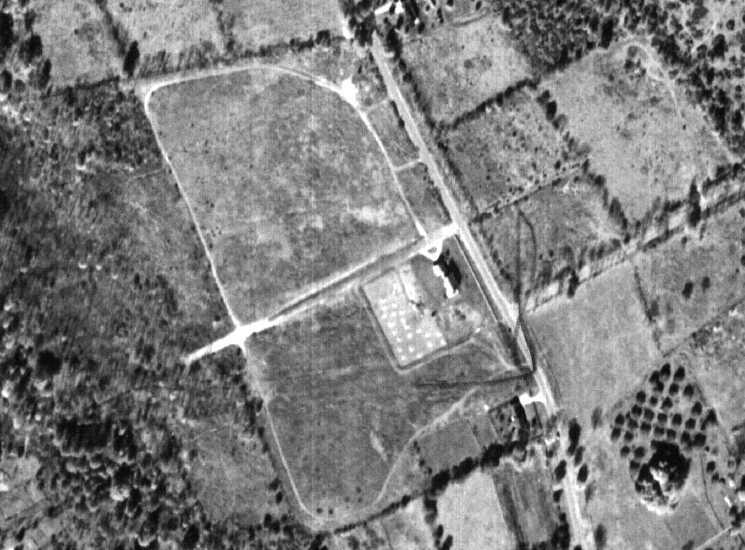 Ansonia Airport, as depicted on a 4/21/49 USGS aerial photo. and Ansonia was not yet depicted on the January 1945 NY Sectional Chart (courtesy of Ron Plante). 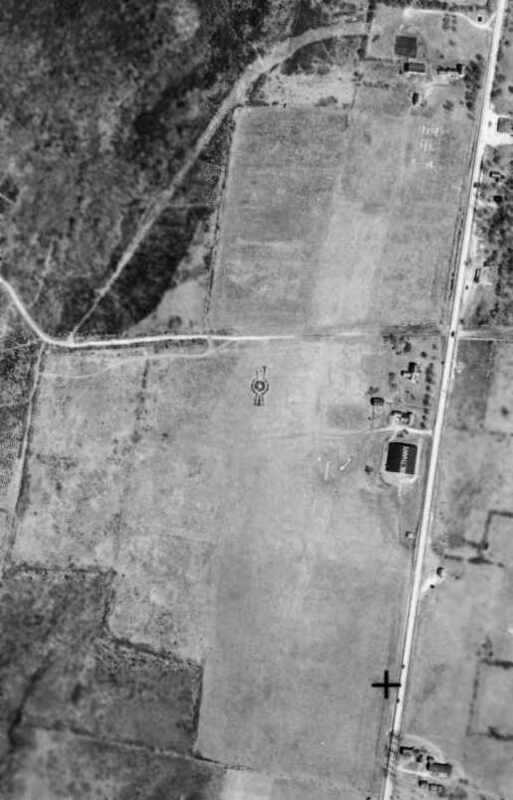 The earliest photo which has been located of Ansonia Airport was a 4/21/49 USGS aerial view. It depicted a grass northwest/southeast runway, with a single hangar & some smaller buildings at the southeast side. which depicted Ansonia as having a mere 1,800' unpaved runway. 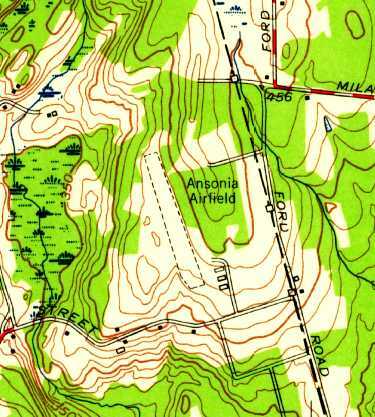 The 1953 USGS topo map depicted “Ansonia Airfield” as having a northwest/southeast unpaved runway with 3 small buildings on the southeast side. On 7/8/55 the Army announced that they would be acquiring several parcels of land for a Nike Ajax missile installation in Ansonia. 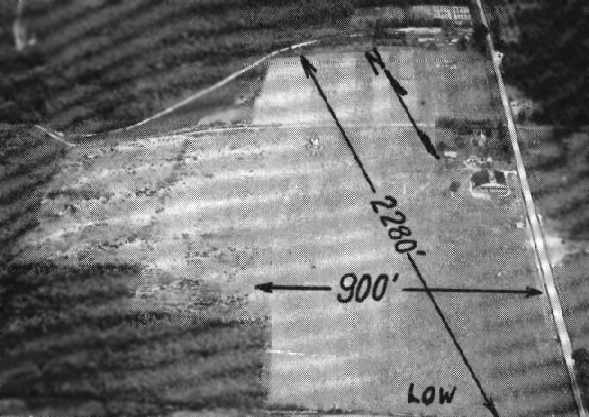 An undated aerial view looking northeast at Ansonia Airport from the 1956 CT Airport Directory (courtesy of Stephen Mahaley). The directory described Ansonia as having an 1,800' sod north/south runway, and 3 hangars were depicted at the southeast side. The operator was listed as Ansonia Airport Inc., and the manager as Chester Zebrowski. equipped with the 1st-generation Nike Ajax missile. and the Launch Site was located less than a mile to the north. right next to a military installation housing radar-guided supersonic surface-to-air missiles. In the mid-1960s, Ansonia Nike Site BR-04 was the only Nike battery in the Bridgeport Defense Area to be upgraded to the 2nd-generation Nike Hercules missile. The residents of the small town probably had no idea that some of the Nike Hercules missiles were equipped with a nuclear warhead. A 1963 aerial photo showed that Ansonia had gained a 2nd hangar at some point between 1949-63. A single light plane was visible near the hangars. which depicted Ansonia as having a 1,700' unpaved runway. 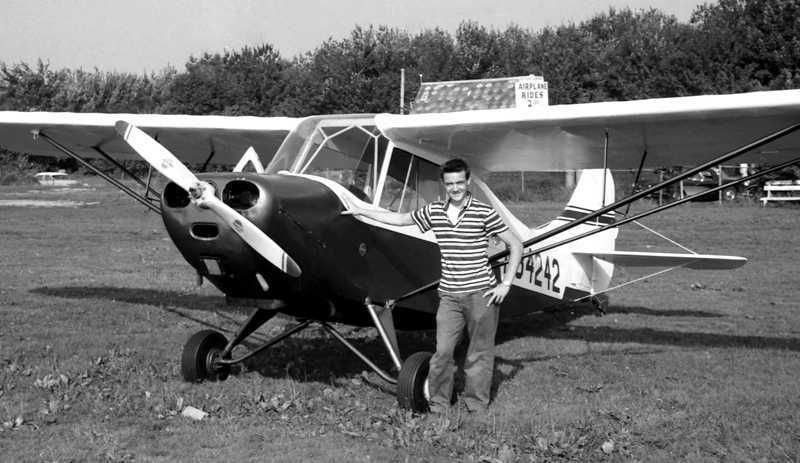 A 1960s photo of Karl Benner in front of his Jungster 1 at Ansonia Airport. Von Moody recalled that he “Solo'd [at Ansonia Airport in January 1966. Fairchilds, Stearmans, PT-22 & 23, F8F Bearcat, Waco's, Stinson, Cubs, Aeroncas and many other classics were based there, lots of history. 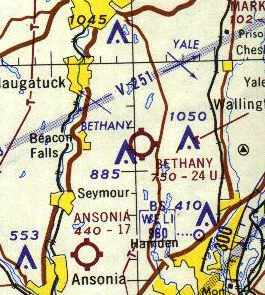 The 1968 Flight Guide (courtesy of Bob Levittan) depicted Ansonia Airport as having a 1,700' unpaved Runway 17/35 with 5 small buildings on the southeast side. Fred Ouweleen recalled, “I discovered Ansonia Airport when I moved nearby in January of 1969. I was 16 & decided to learn how to fly. My father decided to pursue this as well & he purchased a 1946 Piper J-3 N88211 for $2,300 which we based at Ansonia. My instructor was Stanley. We would fly together without headsets making communication difficult if not nearly impossible. Funny how it didn’t occur to the majority of the pilot population at the time to wear headsets. He was said to have been a Luftwaffe pilot but my guess is that this was a story that was attributed to him & which he didn’t deny. He was patient & friendly & taught me & my father to fly our Cub. On one occasion he & I took off behind a brown Super Cruiser flown by the airport owner/manager whose first name was Ted. Fred continued, “I would play hookie from high school & head to the airport to clean or fly the Cub. On one of these occasions, a Bearcat owned by a TWA pilot from Danbury circled the field to land. I watched as he drifted halfway down the short field before touching down. I figured he would try to go around but he stuck it on & then proceeded off the runway towards the hangars on the southeast side of the strip. I was sure he was going to flip over & explode but he managed to bring it to a halt after a slow ground loop. He never got out of the plane to inspect for damage but stayed in the cockpit with those big 4 blades continuing to turn. Ted came out & pulled out a branch that was stuck in the landing gear well & he then took off in the other direction. I later retraced the tire tracks of his sojourn off the runway & he missed rocks & potholes by inches. The hangars contained some beautiful airplanes. I recall an ME-108, a Staggerwing and a WACO biplane. A Summer 1969 photo by Ed Cox of Ansonia, showing “the hangar which included the office. The Nord is visible close to the hangar. This hangar had a serious hangar fire in which all aircraft, including the Nord, were lost. Ed Cox recalled, “I took some of my early lessons at Ansonia. They had two J-3s (N2086M & N35515) and a Cessna 150 (N3274J). I also had an opportunity to fly 5-6 times with Stan. He was from Eastern Europe (Lithuania?) and told me he had been impressed into the Luftwaffe where he had flown Stukas. Back in the late 1960s there were a number of classic aircraft in the hangars or that dropped in to visit. A number of these were the first or only examples I have seen. 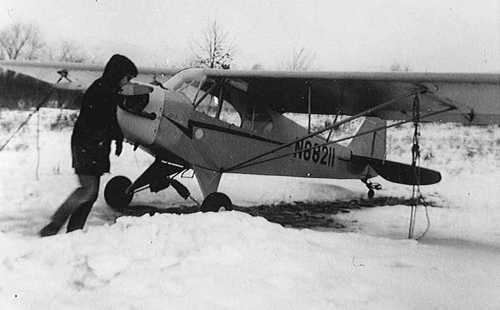 A 1969-70 photo (courtesy of Fred Ouweleen) of Fred Ouweleen with his Piper Cub at a snowy Ansonia Airport. Fred Ouweleen recalled, “In the summer of 1970, our family moved away. I flew the J-3 out of Ansonia for the last time on a long cross country to St. Louis. We sold the J-3 & bought a Cessna 170. In the summer of 1971 or 72 I flew it from St. Louis to CT. I intended to fly it out of Ansonia with a friend to Long Island to go camping. We had full fuel and halfway down the runway I could see we just might fly into the trees on the north end. So fortunately I aborted the takeoff, off loaded fuel & asked my friend to meet me at Tweed New Haven. Fred continued, “I have many warm memories of Ansonia & the adventures I had there. and become connected with an eclectic group of people. I am grateful to my parents who supported my flying & made this experience possible. John Boyce recalled, “I made a few flights out of Ansonia. Teddy Tsovaris rented me a Cub that was probably not airworthy, lacking some required instruments. But cheap. I think it was $8/hour. The maintenance operation was run by a former EAL flight engineer, Bill Neukom. I flew my Fairchild 24 in there for an annual, but it never got done. I couldn't get hangar space & it deteriorated badly, so I took it apart, improvised some sort of trailer hitch-up & towed it home. The F8F was flown by TWA Captain Ron Reynolds. There were some beautiful aircraft lost in that fire. Ansonia's Nike Battery BR-04 was decommissioned in June, 1971.
with a total of 8 light planes visible on the field. 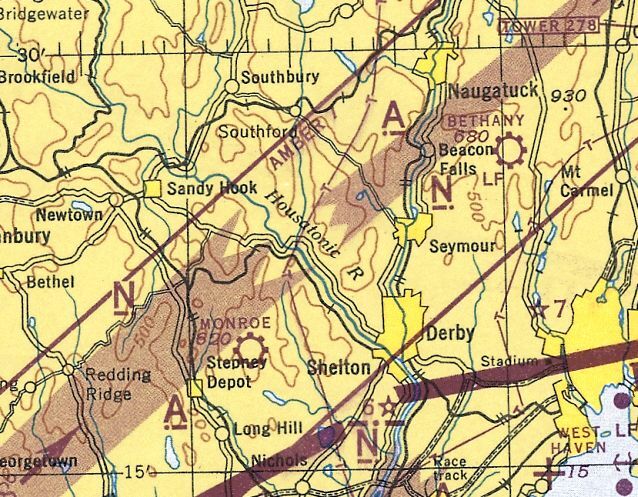 The last map depiction which has been located which still labeled Ansonia Airport was on the 1972 USGS topo map. A 1973 photo by Bob Biancur of a row of 8 single-engine planes at Ansonia Airport. though calling that grass patch an airport is a bit of a stretch. a few leaky-roofed hangars, and a faded windsock that looked like a relic from barnstorming days. It wasn’t much, but it was the next-best thing to heaven for a bunch of aviators who could only afford to fly on a shoestring budget. Luscombe, Bellanca, Aircoupe, Stinson, and of course the venerable Piper and Cessna. The few amenities we had were not without quirks. For example, we had to avoid congregating in certain areas of the hut to avoid weak spots in the floor. Bob continued, “One unique aspect of the flying club, perhaps taken for granted, were the veteran pilots who were always ready to lend a hand. Without that special camaraderie the airport would never have lasted as long as it did. Most memorable was Stan Cekanouskas, our flight instructor. He could hold us spellbound with exciting exploits of Stuka dive bombing during WWII. John Uhock, airport manager & keeper of the books. Chet Zembrowski, principal owner of the field. Pete Peterson, the the go to person for technical advice. Leon Redmond, our chief mechanic, kept ‘em patched & flyin’. Coonie Hewitt, a former Army Air Corps flight instructor, always ready to help a novice flyer 'straighten out & fly right'. Walter Schlagel, sold me my first plane, and Joe Sliby, a fellow aviator who scoffed at the notion that something couldn’t be done. A 1975 aerial view by Bob Biancur looking east at Ansonia Airport from his Cessna 120. The Nike Integrated Fire Control Site was visible right behind the airport. Joe Ursone recalled, “I was 14 years old when I was first introduced to Ansonia Airport in 1977. Matt Valleau recalled, “I moved to Connecticut in 1988, and the airport was in it's final throws then. 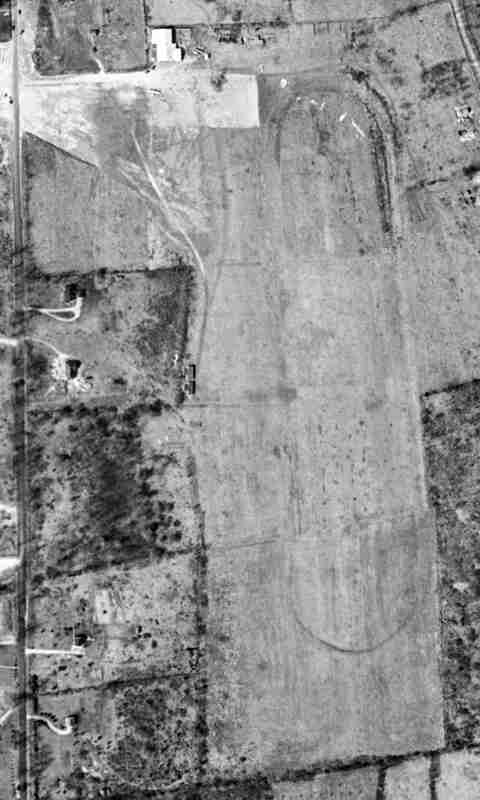 The last photo which has been located showing Ansonia Airport still intact was the 4/3/91 USGS aerial view. The runway & hangars were still intact, but there did not appear to be any recent aviation usage. The adjacent Nike Integrated Fire Control Site to the east also remained largely intact. 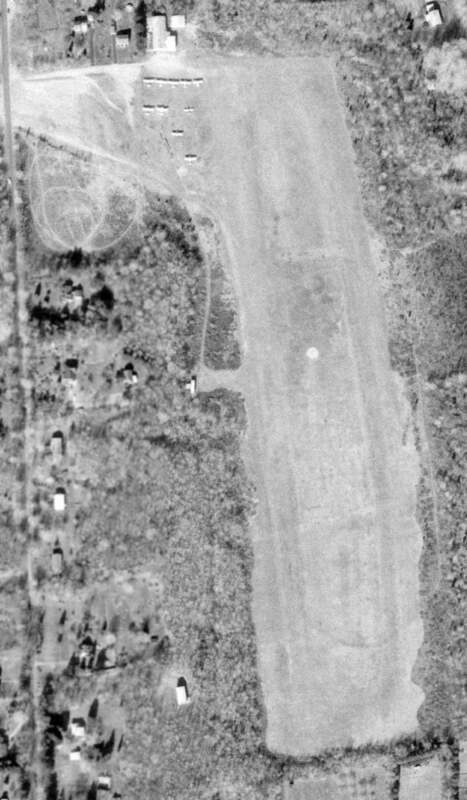 A 2004 aerial photo showed that houses were built over the site of Ansonia Airport at some point between 1991-2004.
with only a clearing remaining at the site of the north end of the runway. all having succumbed to the pressure of land developers, excessive regulation, exorbitant costs & lack of affordable planes. or the chance passing of a biplane with its unmistakable throaty radial engine, I’m reminded of Ansonia’s halcyon days. It was a hoot while it lasted. I drove out to see if I could recognize anything of the airport. 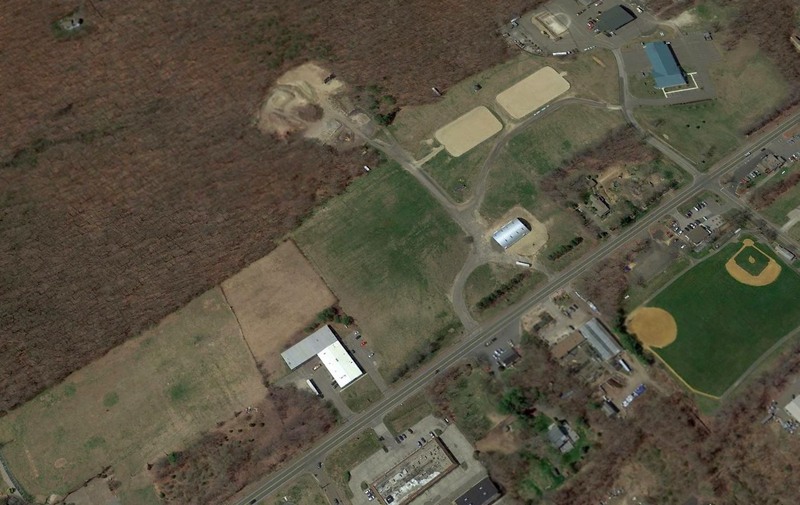 The site of Ansonia Airport is located northwest of the intersection of Ford Street & Sobin Drive. 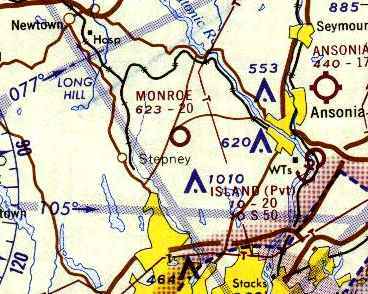 Monroe Airport, as depicted on the January 1945 NY Sectional Chart (courtesy of Ron Plante). Kevin Daly recalled, “I grew up on Pamela Drive at the south end of Wheeler just beyond Cross Hill Road. You could say that my location and a boyhood fascination with the Monroe Airport sort of define who I am even today. Lois Hurd's grandfather, Ambrose Hurd owned & farmed the land where the airport would eventually be built. The fields were once divided by stone walls from Moose Hill Road east to Wheeler Road & were filled with grazing dairy cows. Ambrose died in 1929 from injuries he sustained from being kicked by a farm animal - either a horse or cow. After Ambrose died his son Ben immediately sold off all the dairy cows. Kevin continued, “In the early 1930s there was a car race track practically at the intersection of what we know as Four Corners in Shelton. This was a very successful venture during the early Depression years & Ben saw an opportunity to open a larger track in Monroe on the former farmland. So what you know as the The Monroe Airport was once a thriving racetrack. Cars reached speeds of nearly 100 MPH. And you thought Monroe was a quiet farming town. Not in 1934 it wasn't. 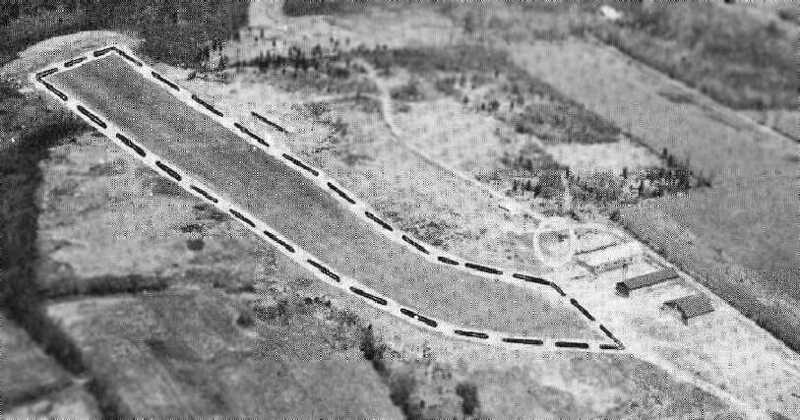 A 1934 aerial photo showed an oval racetrack on the property. According to a local resident, “The track lasted for a few years & during this time Ben was taking flying lesson at Bridgeport Airport. He'd caught the flying bug. and ran all the way north to where the Monroe Firehouse is today - basically Hurd Avenue. In the late 1930s tensions of war in Europe gave Ben another idea. He would build an airport & teach pilots to fly should America become involved in the war. One of Ben's jobs at this time was building roads & he had earthmoving equipment at his disposal. and dig long trenches across racetrack to bury all the stone walls which spanned the track's infield. Once the trenches were dug they pushed the walls in & buried them. According to a local resident, “The airport was opened in 1940.
and her mother sold hot dogs in the canteen attached to the main hangar. But then the Empire of Japan attacked Pearl Harbor & we were in a World War. Shortly thereafter the government closed all airfields which were within potential attacking distance of the coast. Lois Hurd Hayden recalled, “Ben had the airport open only a short time when WW II began. We had to have 24 hour guard, and we girls took turns sitting up with either Mom or Dad on duty. The folks didn't get much sleep. At the time the hangar was being built & in the early morning hours, it looked like the studs & rafters were moving. Then the government closed all airports within 50 miles of the coast on short notice. A good many of the airports in Southern CT & NY moved their personnel and equipment to Stormville, Greenhaven, and Wappingers Falls, NY. We were training guys & gals to get their licenses so they could enlist in the Air Force & have a step-up on other enlistees. Monroe Airport was not depicted at all on the November 1942 NY Sectional Chart (courtesy of Ron Plante). Lois Hurd Hayden recalled, “By Thanksgiving of 1942 Monroe Airport was in business at Wingdale & our family moved there for about 2 years. During 1944, the airspace was lifted and we were allowed to fly in a narrow corridor back & forth from Wingdale to Monroe which reopened about mid-July. 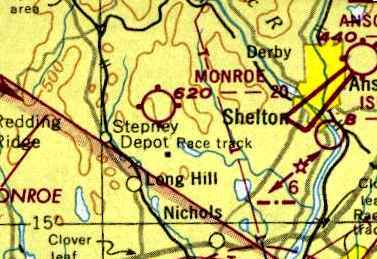 The earliest depiction which has been located of Monroe Airport was on the January 1945 NY Sectional Chart (courtesy of Ron Plante). Lois Hurd Hayden recalled, “Finally, we moved back to Hurdsden that fall. We all had a celebration in the summer of 1945 with the Victory in Europe & then in Japan. 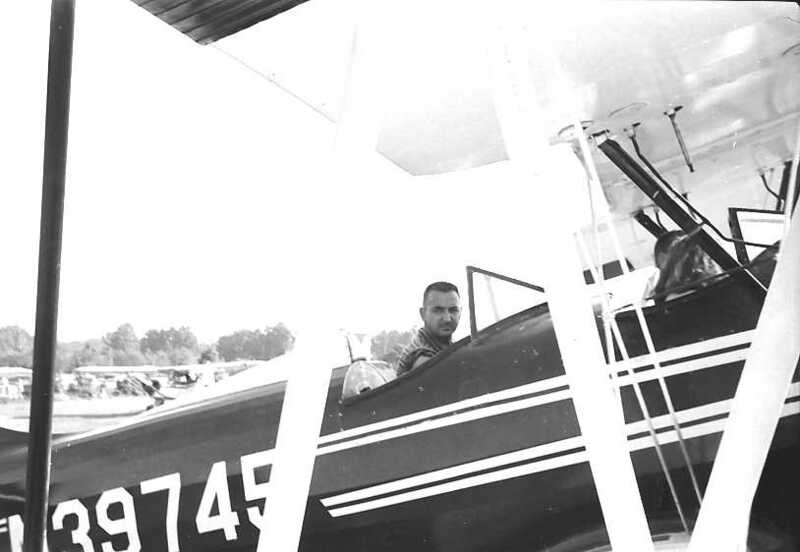 Faith Krysta-Johnson recalled, “Our father (Norman Krysta) earned his pilot license from a woman at Monroe & kept his Taylorcraft BC12-D at that airport. He bought the airplane in 1946 when we were toddlers. 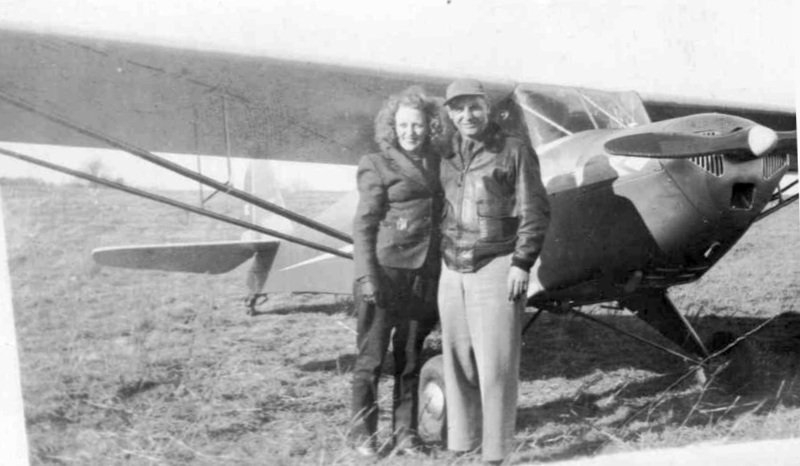 was a circa 1946 photo (courtesy of Faith Johnson) of her father (Norman Krysta) & his sister (Catherine Krysta Edwards) in front of a Taylorcraft. 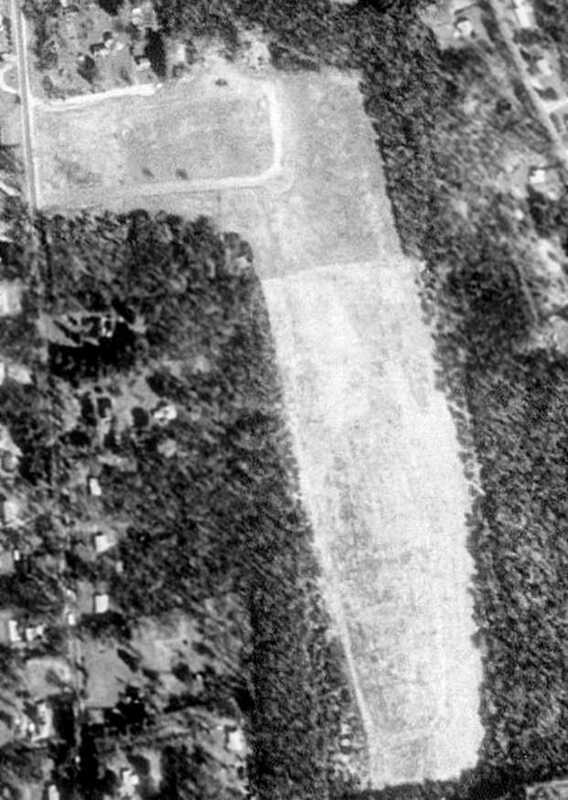 The earliest aerial view which has been located of Monroe Airport was a 4/12/49 USGS aerial view. near which was parked a single light plane. 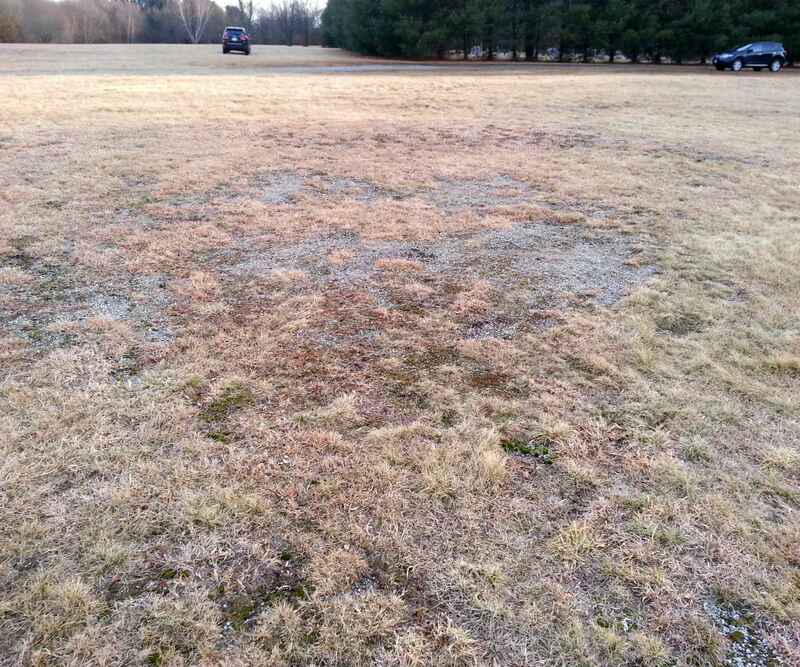 Traces of the oval racetrack were still visible, in the area which had become the grass north/south runway. 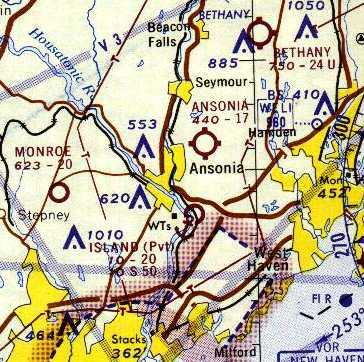 The 1950 NY Sectional Chart depicted Monroe Airport as having a 2,000' unpaved runway. with another young pilot who worked at the airport's gas line. She wasn't even 16 years old at the time. Tragedy struck the Hurd family in the summer of 1955 when Ben's plane crashed into a mountainside in NY State on their way to Vermont. One of Monroe's most forward-thinking men was no longer. An undated aerial view looking northeast at Monroe Airport from the 1956 CT Airport Directory (courtesy of Stephen Mahaley). The directory described Monroe as having a 2,000' sod north/south runway, and a hangar depicted at the north side. The operator was listed as Monroe Flying Service, and the manager as Edward Czap. A circa 1962 photo (courtesy of Bill Feeny) of Bill's family in front of an Aeronca Champ at Monroe Airport. Bill Feeny recalled, “My youngest brother probably going to get his 1st flight. My father painted the Native American logo on the Aeronca Champ. I mostly flew in a J3 Cub. I think myself & siblings all flew before we could walk. In the pilot's room or whatever it was between the office & the hangar were some splendid & possibly valuable pictures on the wall done by Robert Osborn around WWII. They are hilarious cartoons drawn with panache. In the hangar was a coke machine with a heavy steel lever to deliver your coke in a glass bottle for 5 cents. 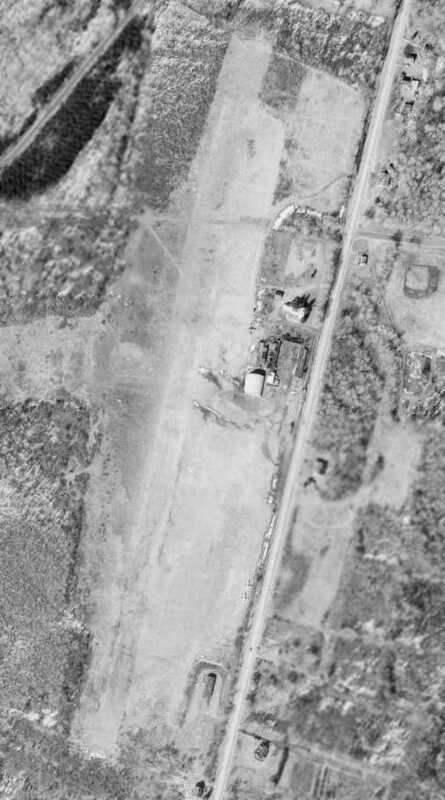 A total of 3 light planes were visible near Monroe's hangar in a 1963 aerial photo. 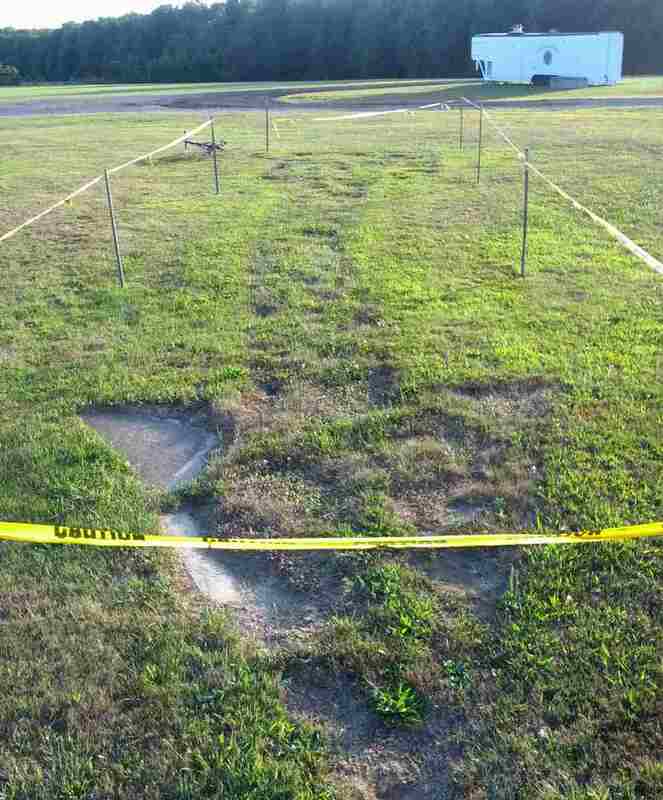 Traces of the oval racetrack were still quite apparent. which depicted Monroe as having a 2,000' unpaved runway. A 1965 aerial view of Monroe Airport (courtesy of Kevin Daly). Lois Hurd Hayden recalled, “Later Connie Grasso & his brother Nick, leased the airport. Von Moody recalled, “Monroe Airport... run by Connie & Nick Grasso. with 1 small building on the west side. with a total of 10 light planes visible on the field. Sean Fowler recalled, “As a child, I lived off of Cross Hill Road & would watch skydivers drop in there. I think they used T-10 rounds or some early equivalent. An undated photo of the Monroe Airport hangar (courtesy of Dave Jaundrill). was a 1970s photo of Chuck & Judy Neuchterlain in front of their Stearman at Monroe (courtesy of Dave Jaundrill). 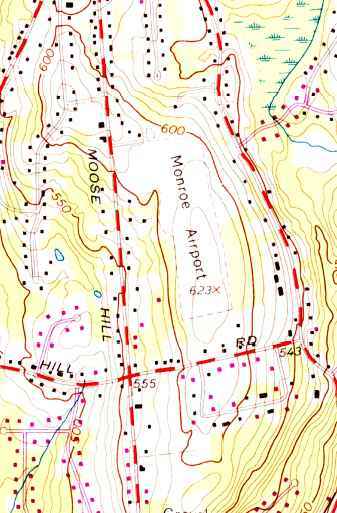 The last depiction which has been located showing Monroe Airport was on the 1973 USGS topo map. It depicted Monroe as having a north/south unpaved runway, with a single small hangar on the northwest side. According to a local resident, “The airport was unofficially closed by 1973.
and the hangar had evidently been removed. Sean Fowler recalled, “I actually managed to fly out of the Monroe Field a few times in a powered parachute (paraplane) back in 2004. A stern talking-to from a local officer trying to hold back laughter brought that to an end, however. A 2006 aerial view by Dave looking northeast depicted 2 cemeteries & a cell phone tower occupying the site of Monroe Airport. 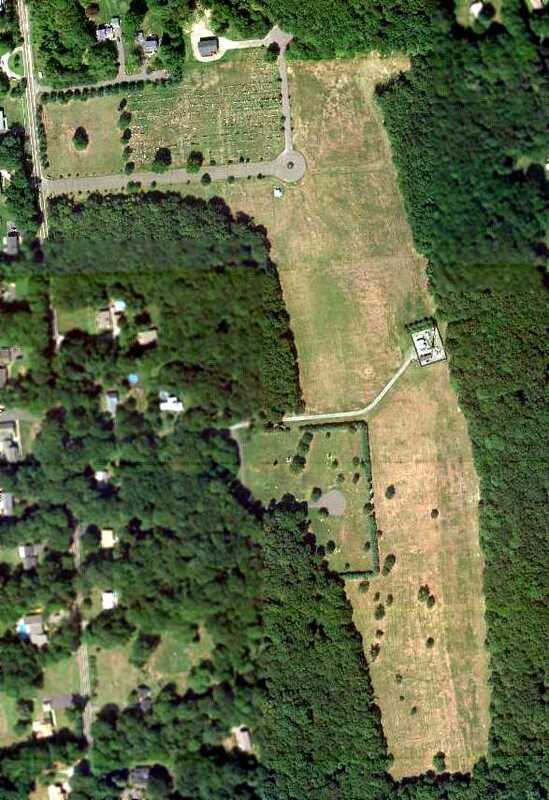 An 8/31/10 aerial view depicted 2 cemeteries & a cell phone tower occupying the site of Monroe Airport. 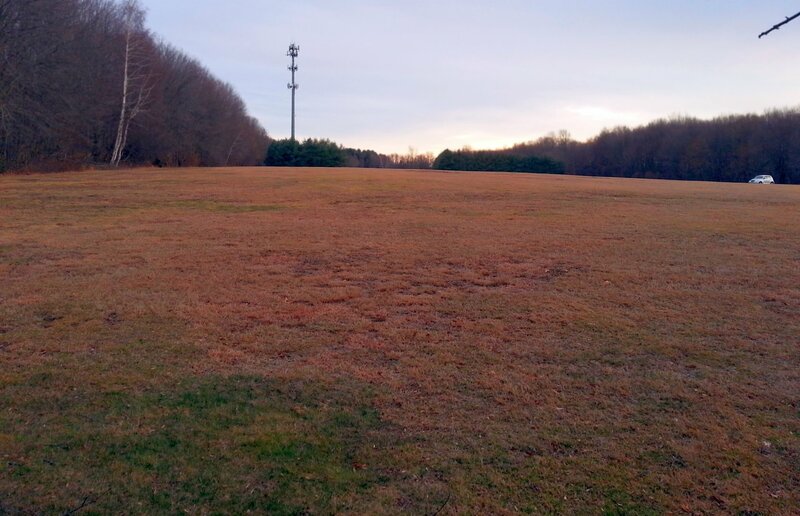 According to a local resident, “The land is now primarily Saint John's Cemetery. 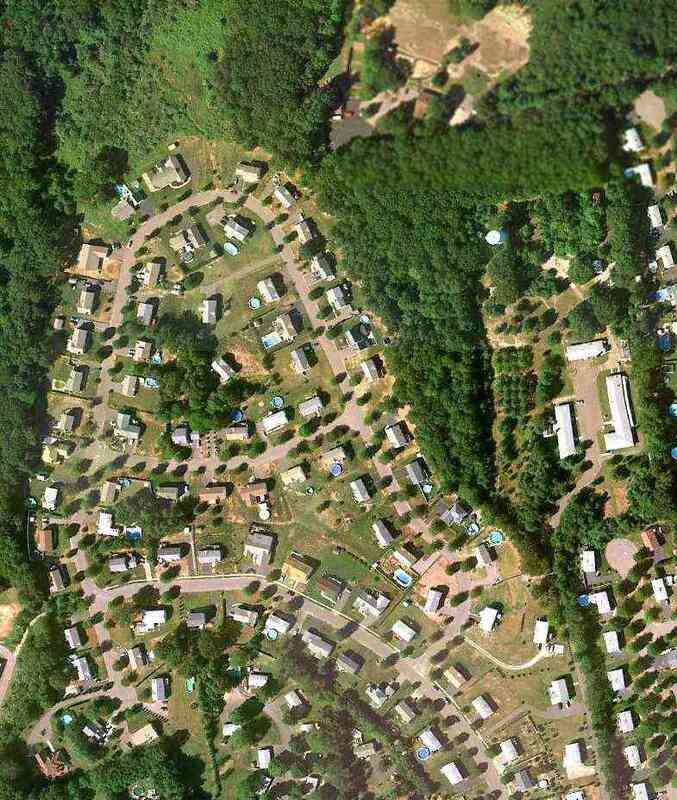 It also contains a small Jewish Cemetery & a cell phone tower. The field's windsock... 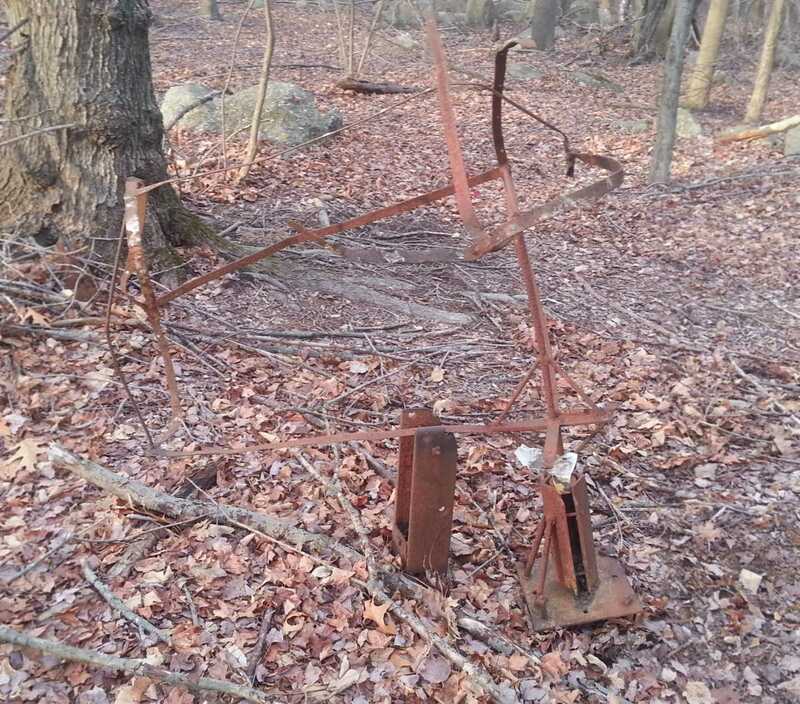 I discovered the original remains of the windsock in the woods a few years back. Faith Krysta-Johnson reported in 2014, “A few years ago, I did find the little airport, parked my car & went out into the fields. The gentlemen who was cutting the grass stopped his machine & wanted to know if I was OK as he saw tears coming down my face. A 2/8/17 photo by John Paul looking south along the former Monroe Airport runway. John reported, “What surprised me was the number of people there just because of the weather. A 2/8/17 photo by John Paul of the remains of the Monroe Airport windsock pole. A 2/8/17 photo by John Paul of the remains of the Monroe Airport skydiving target. The site of Monroe Airport is located northwest of the intersection of Monroe Road & Cross Hill Road. 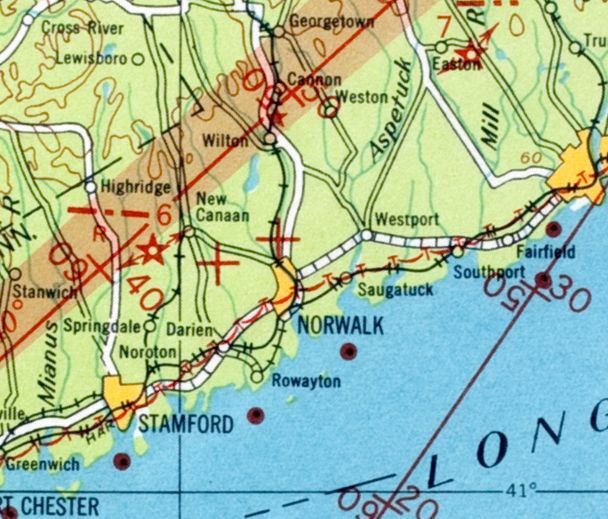 Johnnycake Airport, as depicted on the January 1963 NY Sectional Chart (courtesy of Chris Kennedy). as it was not yet depicted at all on a 1955 aerial photo, nor on the 1958 NY Sectional Chart. 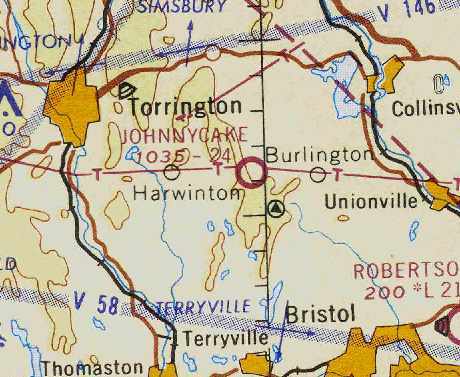 came from Steve Walcott, who recalled, “We moved to Harwinton (2 miles southwest of JohnnyCake) in the late spring of 1960. The airport was a well established airfield at that time, although the runway was turf. were located on the Litchfield County / Harwinton side of the line. 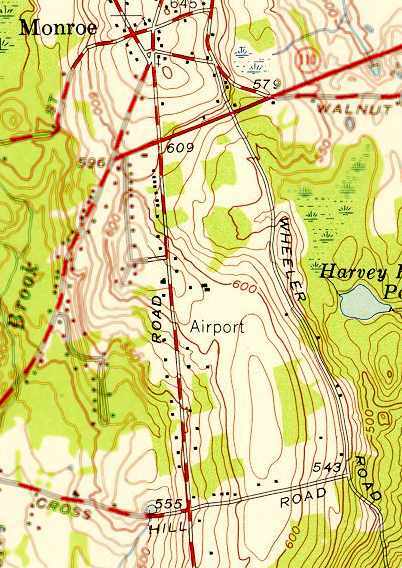 Jonnycake Airport was not yet depicted on the 1962 USGS topo map. John Clark recalled, “Johnnycake.. I was an instructor there for about 3 months in the early 1960s. When I was at Johnnycake I worked for Fred & the runway was probably one of the worst around. It was turf but that is a nice word in relation to the actual condition of the runway. Rock & rough would be a better description of it's condition. I had a tailwheel vibrate right off of a Cessna 170 on one landing there. was on the January 1963 NY Sectional Chart (courtesy of Chris Kennedy). Steve Walcott recalled, “I began flight training at Johnnycake in 1965. It then had a 2,800’ newly-paved runway (but no markings). By late 1967 the south 400’ had deteriorated & the length was redesignated back to the original 2,400’. Still no taxiway, still no markings. (I dinged the empenage on those in a Cessna 150 while on final approach due to wind shear that closed the airport after I landed). 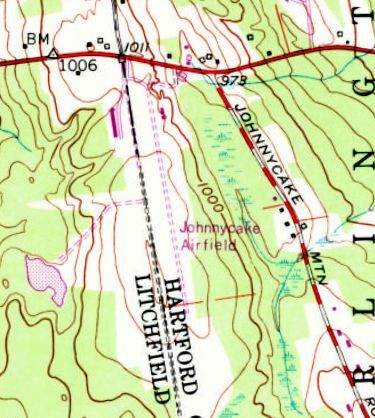 The 1969 USGS topo map depicted “Johnnycake Airfield” as having a single unpaved northwest/southeast runway, with a small building at the north end. depicted Johnnycake as having a single 2,400' paved runway. depicted Johnnycake as having a single 3,420' paved Runway 1/19, with a parallel turf taxiway on the west side. along with the Prop Stop Restaurant on the southwest side, and the terminal & office on the west side of the field. An undated (circa 1990s?) view of a Cessna 152 in front of Johnnycake's office building & hangars. An undated (circa 1990s?) 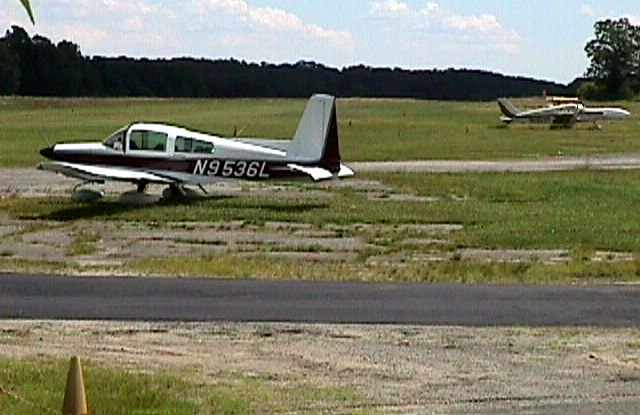 view of a Grumman American Tiger & a Piper twin at Johnnycake. An undated (circa 1990s?) 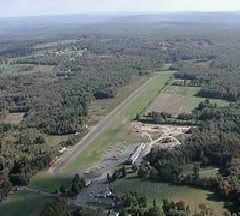 aerial view looking southeast at Johnnycake Airport. which showed over a dozen light aircraft on the ramp on the northwest side. 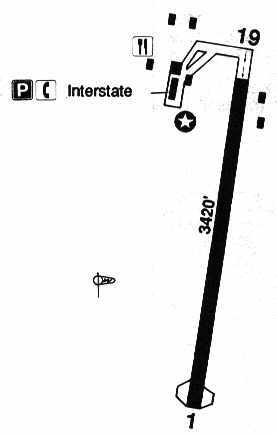 The 1993 Jeppesen Airport Directory depicted Johnnycake as having a single 3,420' paved Runway 1/19. including the offices of Interstate Aviation. as that is how it was depicted on the May 2001 NY Sectional Chart (courtesy of Ron Plante). It was depicted as having a 3,400' paved runway. Mountain Meadow Airport was described as having a single 3,420' asphalt Runway 1/19. and it was said to conduct an average of 36 takeoffs or landings per day. 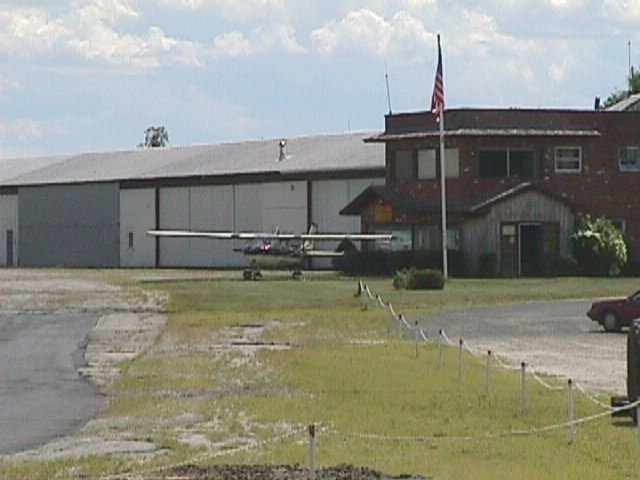 According to the Squadron One Flying Club, Mountain Meadow Airport was reported closed on 4/1/2004. describing efforts to reopen the field. 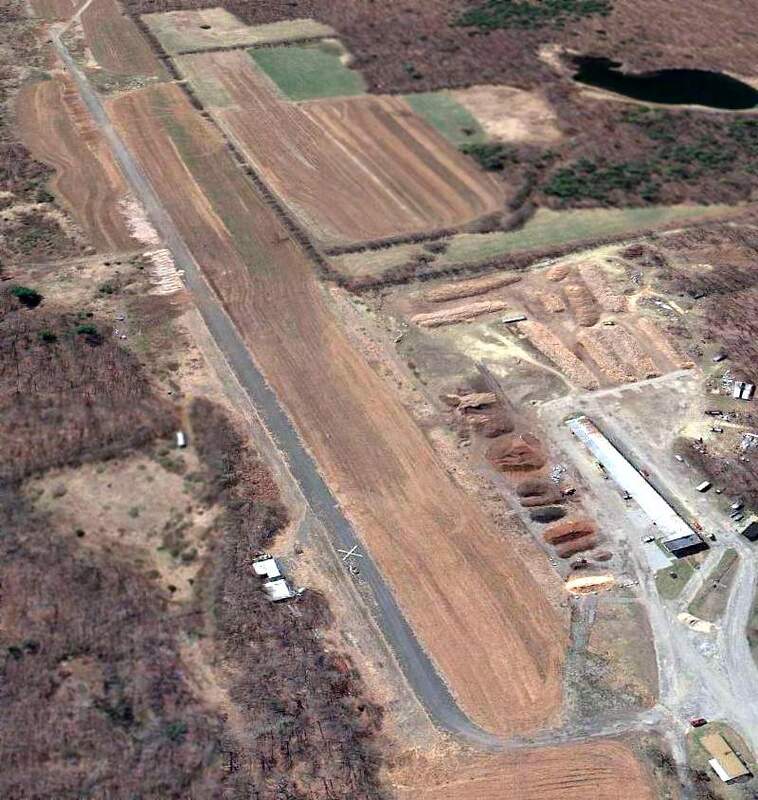 It reported that Johnnycake Mountain Meadows Airport's flight school & fuel depot had closed years ago. said “Airports like Johnnycake are important to aviation. if the towns of Burlington & Harwinton were to buy Johnnycake &reopen it as a municipal airport. and he was refusing to sell. He ridiculed the defense that it could be an engine for regional business growth. "It's been there 50 years, and what do you have? referring to two nearby restaurants that are popular with visiting pilots. "That's it." a prospect that unsettled even some of Johnnycake's supporters. 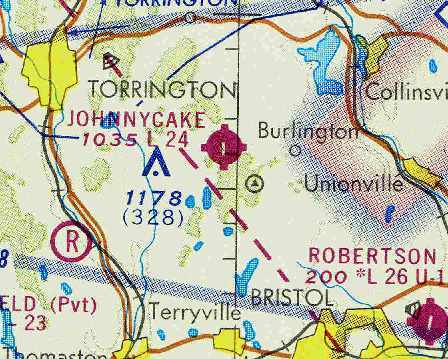 The FAA was interested in Johnnycake because of its location. and Johnnycake was on it. 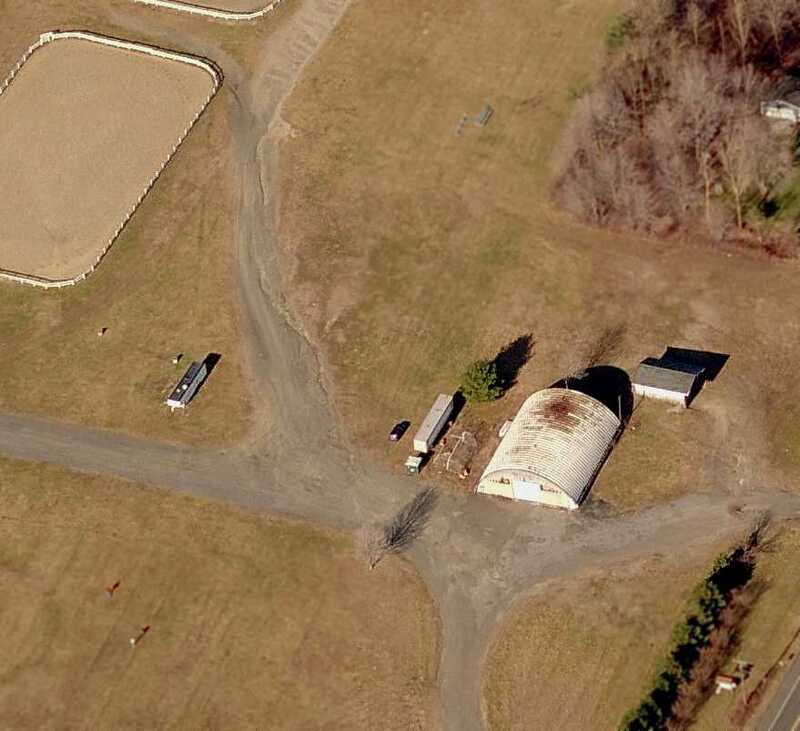 The field is one of only 15 Connecticut airports on the list, and the only one near Litchfield County. Buying Johnnycake, local pilots said, would be a sensible use of public money. But acquiring Johnnycake would be expensive. and pilots said that improving the facilities might run another $1 million. The price could climb higher if Johnnycake's western edge, which was owned by Frederick Pesce, was added. with the CT DOT paying another 3.75 percent, said Richard Jaworski, a DOT transportation engineer. and that's usually for improvements, not acquisitions. and that a potential $5-6 million price tag would be double the agency's yearly budget for municipal airport work in the state. "We seldom buy an airport. But that doesn't necessarily mean anything," he said. "It might be that the location would make it interesting to us." 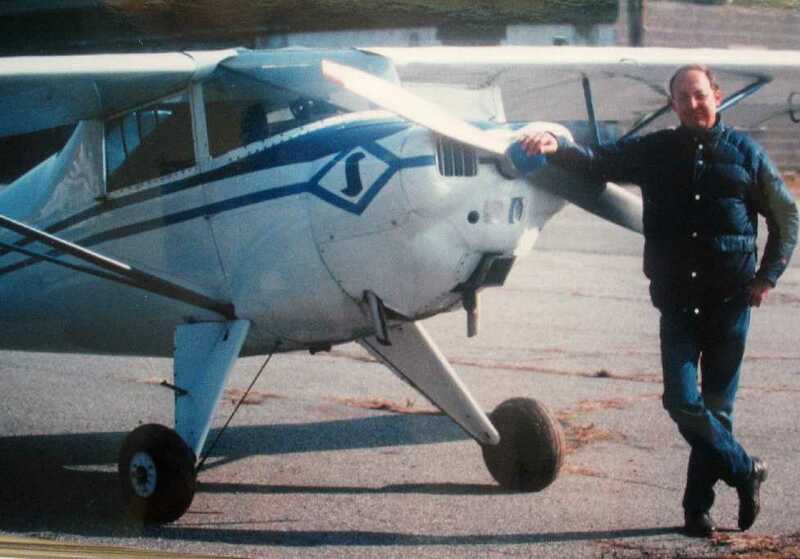 Bill Thomas, president of the Simsbury Flying Club, said saving Johnnycake would benefit the state as a whole. "As Bradley is growing, they'd prefer not to also have an influx of aircraft," he said. "Aviation has an infrastructure - the fewer airports, the more planes will squeeze into the ones left." 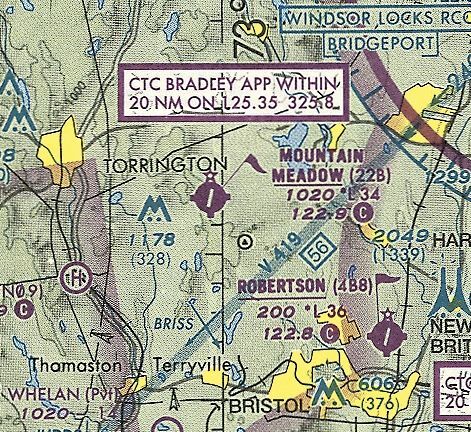 Mountain Meadow was depicted as an abandoned airfield on the 2005 NY Sectional Chart. and no aircraft on the field. but land had been cleared to the south of the hangar for some type of construction. A 3/29/12 aerial view looking southwest showed that the runway & buildings at Jonnycake Airport remained intact though deteriorated. Ian Maher reported of Jonnycake Aiport in 2013, “I drive by it nearly every day. 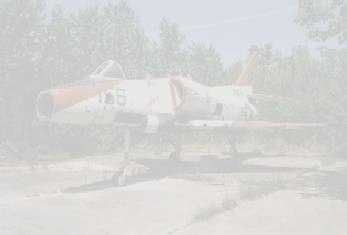 There are no planes; the last aircraft that I saw there was a helicopter being sold in front of Countryside last year. For a while someone was landing their helicopter there, which was a very modern looking one. About 6 years ago, the area seemed to be used for cargo of some kind as well. Helicopters could be seen daily carrying crates over the woods & back to the airport. There has been a sense of mystery any time that the airport is actually used as it was once intended now. Corn is grown in the summer months at the airfield, and the runway is difficult to see from the road. Johnnycake Airport is located southwest of the intersection of Route 4 & Johnnycake Mountain Road. A 1927 photo of Ernest Markham & two unidentified boys in front of a Waco 10 biplane at Bethany Airport (courtesy of Linda Markham Scialabba). was a 1927 photo of an unidentified biplane at Bethany Airport (courtesy of Linda Markham Scialabba). 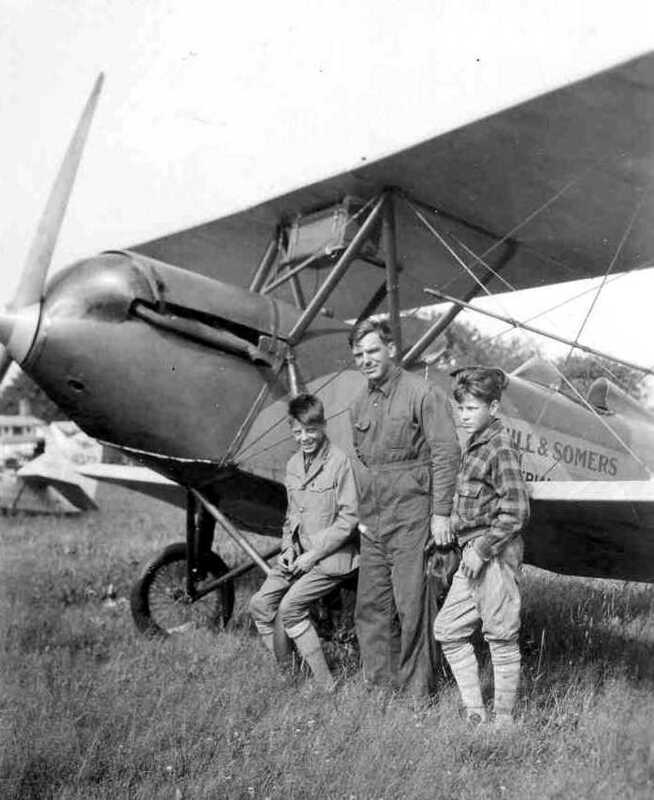 The photo pictured Linda's grandfather, Ernest Markham, and two unidentified boys in front of a biplane marked with “Hill & Somers”. Linda noted, “My uncle tells me they were some type of business, he is not sure if they owned the airport. 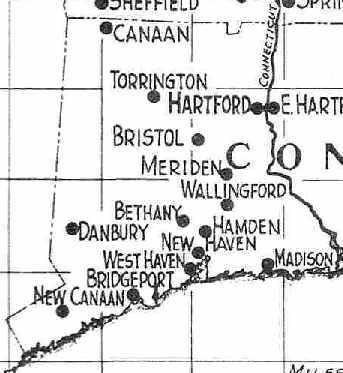 According to Tom O'Connell, “Bethany Airport was rumored to be the 2nd oldest airport in New England after Boston. It described Bethany as a Department of Commerce Intermediate Field. with the entire field available for flying operations. The field was also said to have a 100' x 80' hangar. serving as the Department of Commerce's Intermediate Field, Site 9 along the New York - Boston Airway. 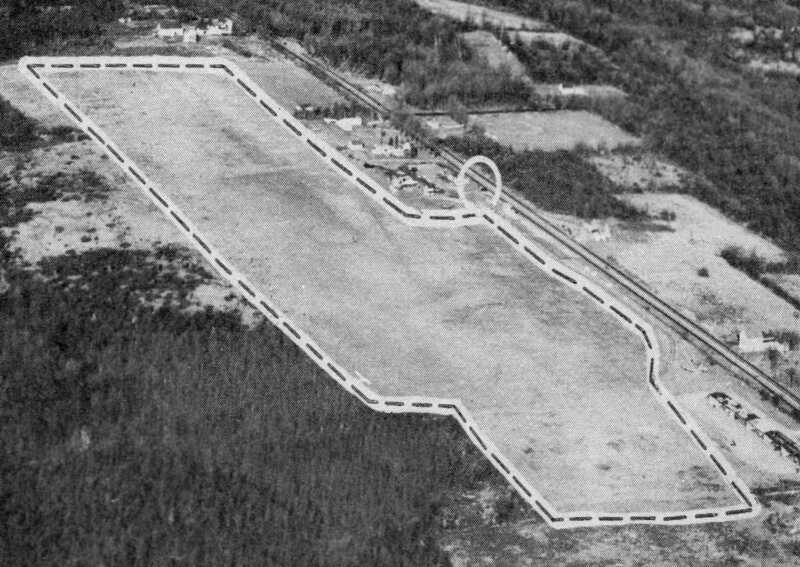 The airfield was described as consisting of an irregularly-shaped 36 acre plot. A 1934 aerial view of Bethany Airport, taken by the Fairchild Aerial Survey Company (courtesy of Chris Kennedy). 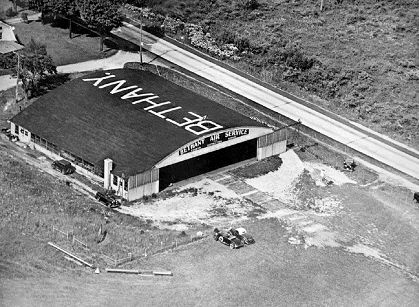 showing the unusual airport marker, and the hangar marked with “Bethany” on the roof. Bobs Macaleenan recalled, “I flew with Jack & Chappy Lenox back in 1929, when I was 7. That is when I started flying. We used to have Fly in breakfasts at Bethany in 1936-38. The directory described Bethany as a commercial airport having 2 sod runways: 2,450' north/south & 1,400' east/west. A single hangar & some other small buildings were depicted along the east side of the field. and many famous pilots visited there...Bert Acosta for one." An undated aerial view looking northeast at the Bethany Air Service hangar. The directory described Bethany as a commercial airport consisting of a 52 acre rectangular field, measuring 2,280' north/south. Bethany Airport was depicted on the November 1942 Regional Aeronautical Chart (according to Chris Kennedy). Bethany Airport, as depicted on the January 1945 NY Sectional Chart (courtesy of Ron Plante). 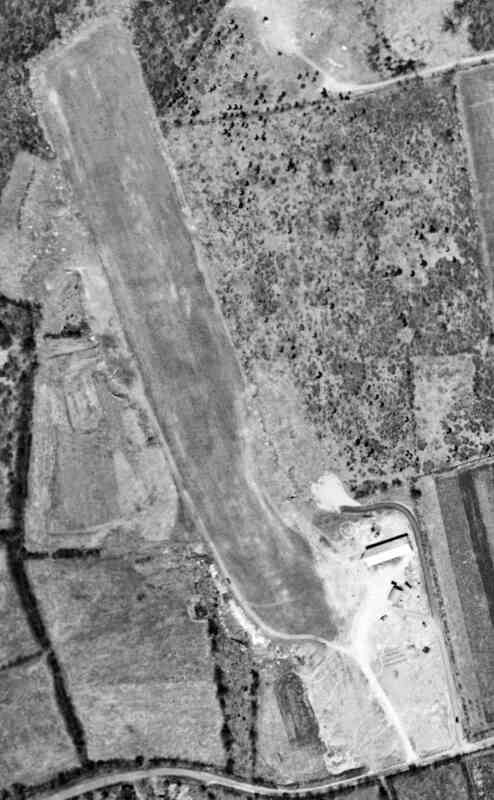 A 1949 aerial photo showed the remains of the original hangar, lost in a fire a few years before. Miles Reese recalled, “My father learned to fly at Bethany in a Aeronca 7AC. He had taken a ride at the airport for $3 & got the bug. I think that was in 1953. He had kept a Taylorcraft BC12D on the south end of the airport. The Fixed Base Operator was owned by Bob Jones & his wife. Bob had taken off in a pretty new Baron that had been bought for charter work. He crashed. He was a very proficient pilot but was very troubled at that point of time. There was a huge push to shut down the airport by then WNHC, Channel 8 in New Haven CT.
but did not depict any runways. 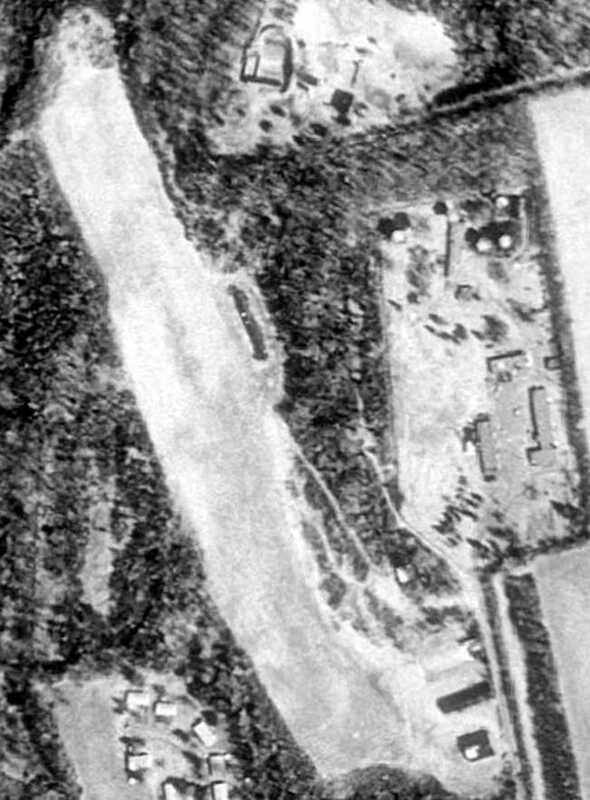 A 1955 aerial photo showed the remains of the original hangar, still not replaced with another structure. An undated aerial view looking northeast at Bethany Airport from the 1956 CT Airport Directory (courtesy of Bill Hecht). It described Bethany Airport as having a 2,800' sod north/south runway, and the manager was listed as Robert Jones. 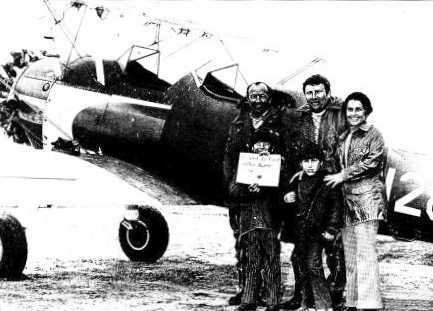 An undated photo of Henry Jones & 2 children in front of a Cessna 170 at Bethany Airport. Edd Wininger recalled, “Bethany Airport... I was learning to fly there during my high school years. I was a 15 year old in 1957 (and on into 1958) who pumped the avgas, pushed around airplanes, propped those who needed a start, etc. on weekends & summers. Drove the old Ford tractor & grass mower around. All for a few 15 minute evening rides. Rode my bike up from Hamden. My Dad did flight instruction on weekends, along with passenger rides & banner towing. Bob Jones & his wife Fran owned & ran the airport. Al Porto was another weekend pilot who also flew the Wacos on occasion with some minor aerobatics for the folks. Bob Jones died following the crash of a newly acquired Beech Travelair, bought for charter use. A summer 1958 aerial view by Edd Weninger looking east at Bethany Airport. “hopping passengers” in a Waco UPF-7 biplane at Bethany Airport. and a sign pointing out “Airplane rides $2.50”. 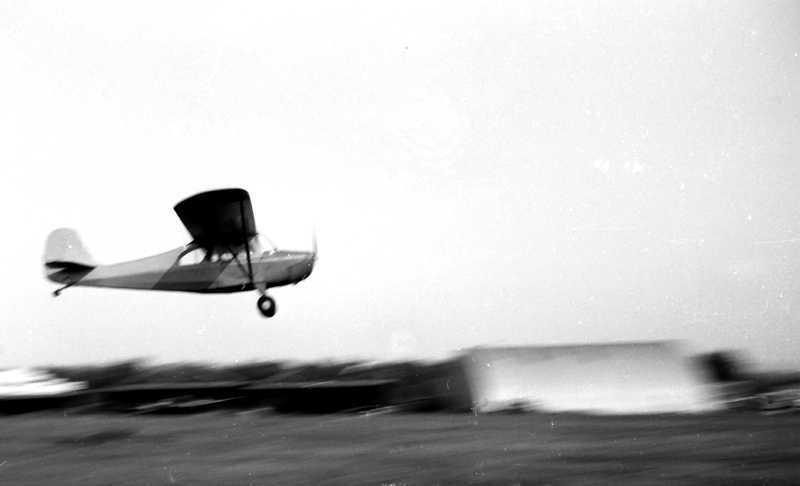 A 1958 photo by Edd Weninger of “one of the rental [Aeronca] 7ACs landing” at Bethany Airport. A 1958 photo (courtesy of Edd Weninger) of a Waco biplane of Bethany Airport Aerial Advertising, with the Bethany hangar visible in the background. A circa 1958 view looking northwest at a biplane & several monoplanes around the Bethany Airport hangar (courtesy of Jonathan Westerling). Edd Weninger observed, “It looks like a typical Sunday where a Waco & the Tripacer were used for passenger rides. as having a single 2,800' turf Runway 18/36. The operator was listed as Albert Porto. 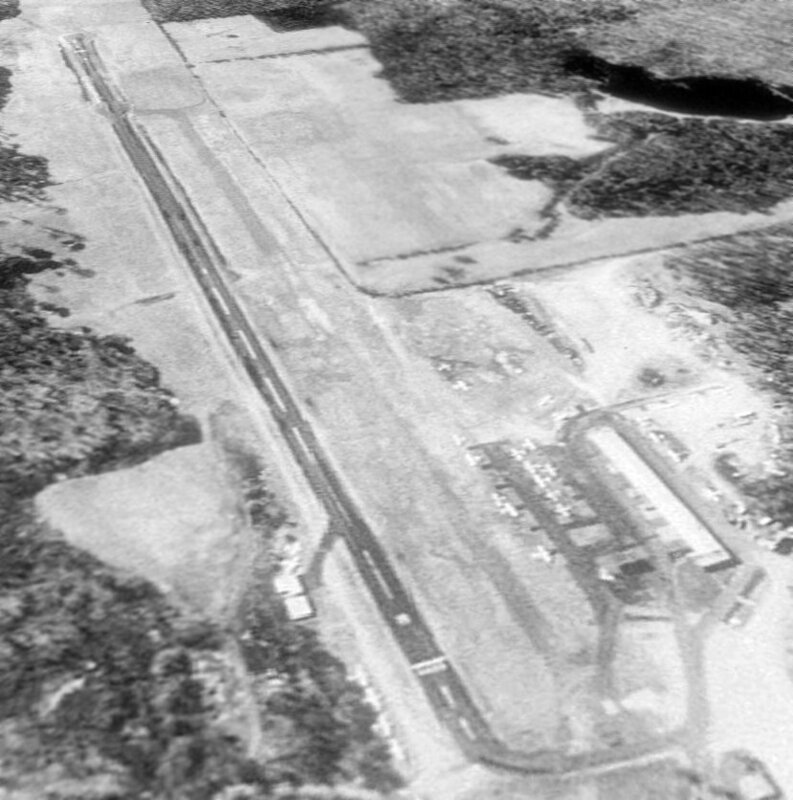 The last photo which has been located showing Bethany Airport in operation was a 1965 aerial view (from the CT State Library, via Chris Kennedy). with the Quonset hut hangar on the east side of the field, and 3 single-engine aircraft on the east side of the field. 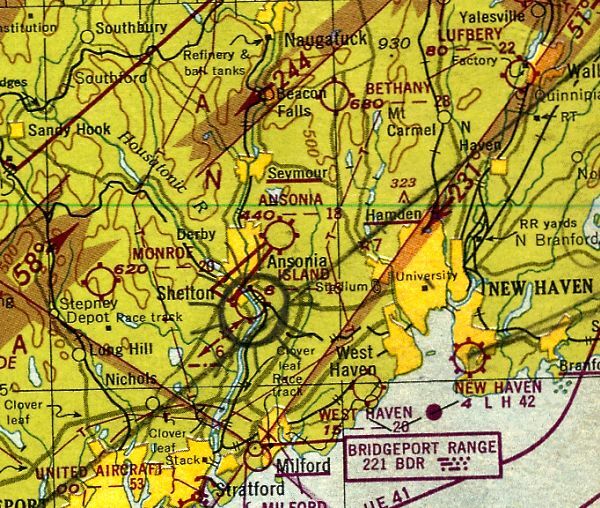 The last aeronautical chart depiction which has been located of Bethany Airport was on the 1965 NY Sectional Chart. It depicted Bethany as having a 2,400' unpaved runway. John Boyce recalled, “I was flying out of Bethany when it closed toward the end of 1965. It was the oldest airport in New England in continuous operation. Clarence Chamberlain was another one of the great old-timers who flew there. Another notable was William F. Buckley, who earned his private certificate there while a student at Yale. Al Porto was the last Fixed Base Operator to operate there, with a lease. The land was owned by Triangle Publications. and the rent Al paid didn't even cover the taxes, so they bought him out. 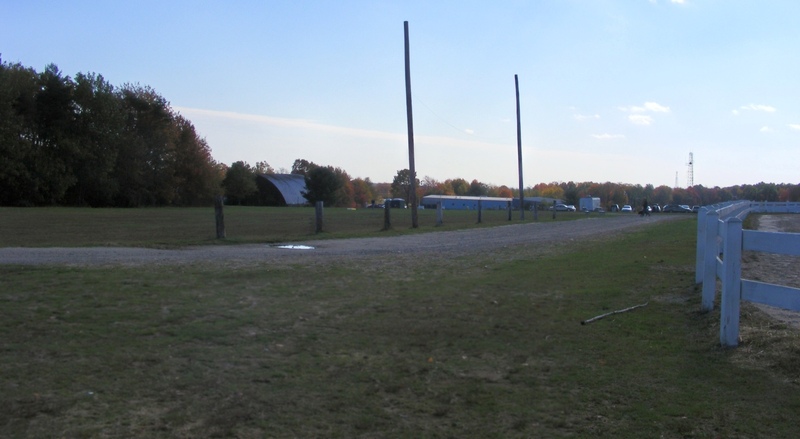 In its last years, the airport was home to the Nutmeg Soaring Association, which thereupon moved to Johnnycake. After a lot bickering, the town bought the airport for $250,000. 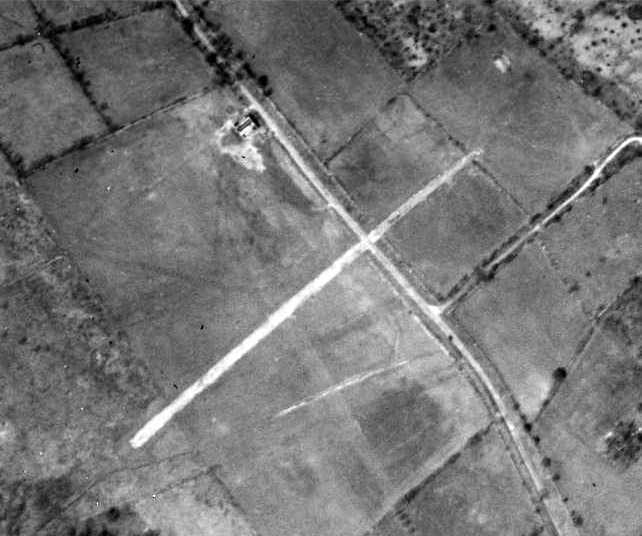 A single large white closed-airport “X” was visible in between the hangar & runway on a 1966 aerial photo. as it was no longer listed among active airports in the 1967 AOPA Airport Directory (according to Chris Kennedy). there were still some original hangars in existence." "The airport surrendered air rights so a television/radio tower could be put up not far away down the hill." and a recycling center was put near the hangar in 1995." with the areas of the north/south & east/west runways remaining largely clear. 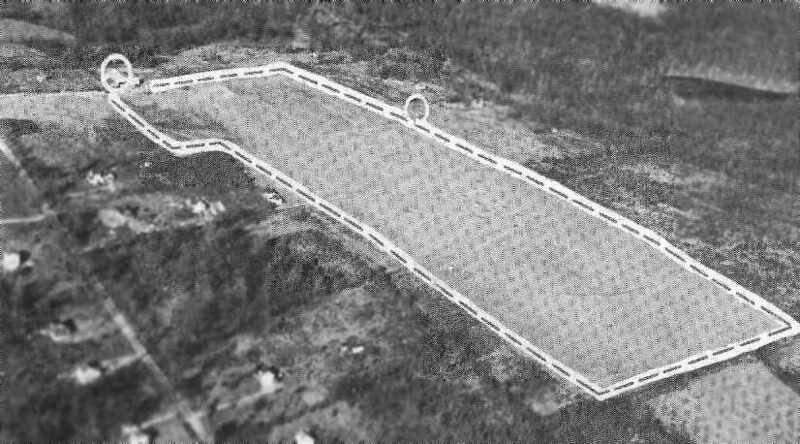 and even the circular airfield marker (used in the 1930s & 1940s to mark a grass airfield) also remained (in the center of the photo). Ed Walsh reported in 2005, "The hangar is now a DOT office & storage area. You could never land a plane of any size there anymore." 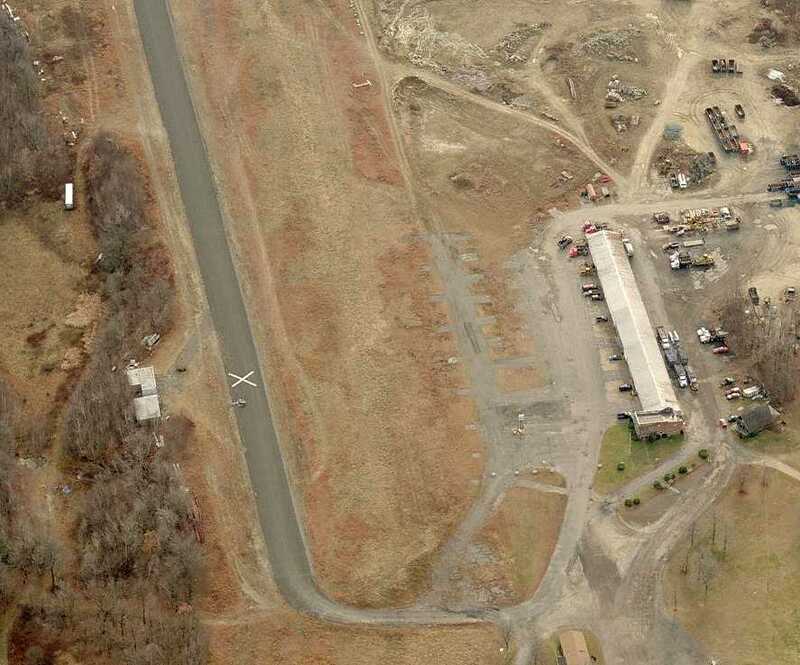 A circa 2006 aerial view looking north at the former Bethany Airport hangar. A 2007 photo of the former Bethany Airport hangar, with its markings faded yet still readable. A 2007 photo of the former Bethany Airport property, with the former hangar visible in the background. 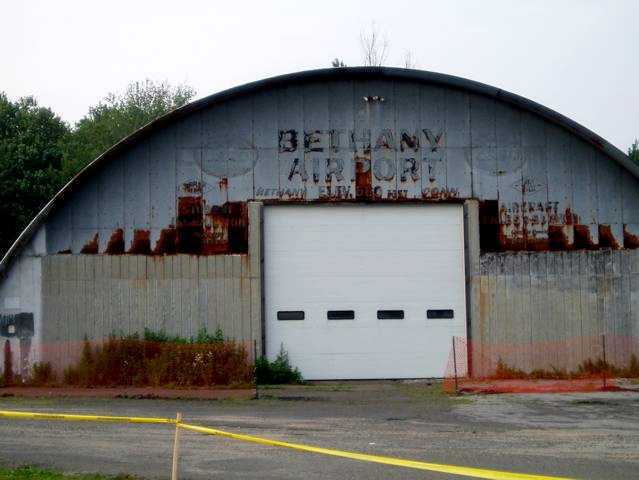 A 2008 photo by Matt Baker of the former Bethany Airport hangar. John Boyce reported in 2009 of the Bethany Airport site, “Most of the open space is used for horse-oriented activities. It is also the home of our recycling facility, the Highway Department, and the Bethany Volunteer Firemen's Association. There is a mattress factory & a driving range, too. Hardly what was envisaged. A 9/19/13 aerial photo showed the Bethany hangar remained standing. Bethany resident Mark Scott reported in 2014, “Volunteers have torn down the old Quonset hangar which was falling down anyway. A 2014 rendering of the planned “Bethany Airport Community Center” (courtesy of Mark Scott). in the form of a Quonset hangar with large doors & a side building. The old airport property is used for many town activities. The community center is a good use of the space. 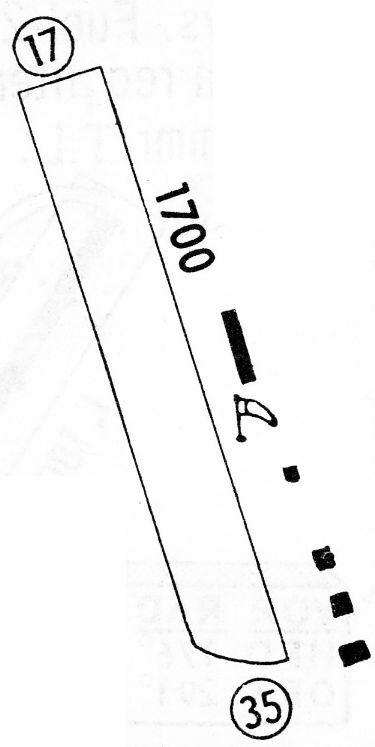 The best part is that we found the old airmail arrow depicted clearly in one of [the preceding] photos. A 2014 photo by Mark Scott looking southwest at the remains of Bethany Airport's 80 year old concrete airmail arrow marker. A 6/5/16 photo by Mark Scott of the remains which were uncovered that day of Bethany Airport's 80 year old concrete airmail arrow marker. 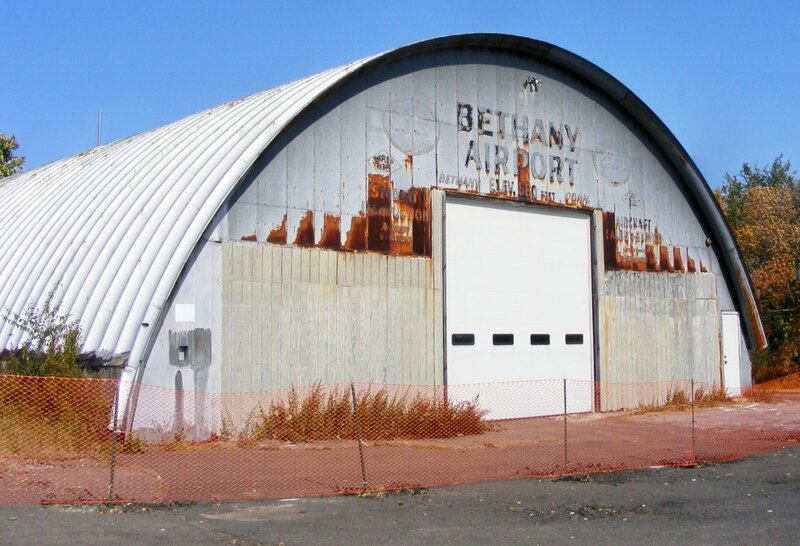 Mark reported, “I am on a committee that is recreating the old Bethany Airport hangar as a community center. 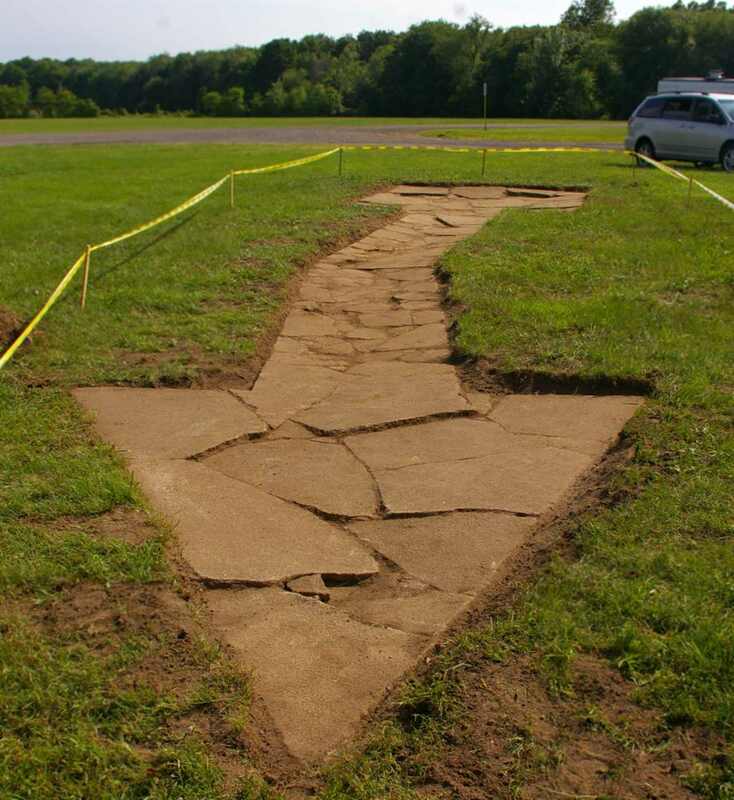 Last Saturday the committee uncovered this concrete directional arrow at the old Bethany Airport. It's really cool. It was made in the 1920s for air mail pilot navigation. It is 70' long. The tail points towards New York, the tip towards Hartford. This is about the time the arrows were made obsolete by radio navigation. We think it has been covered for about 40 years. It is quite broken up from all the frost heaving but it is all there. We are not sure if we will leave it as is or restore it. 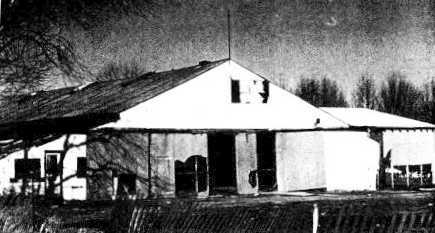 but the silver arch-roofed hangar remained standing (in the center of the photo). 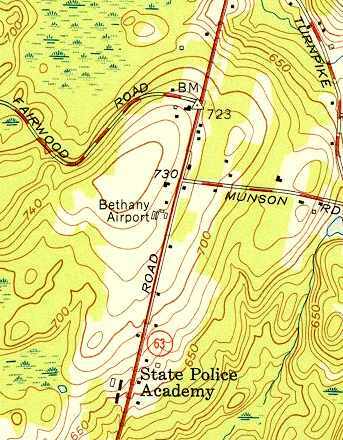 The site of Bethany Airport is located west of the intersection of Amity Road & Munson Road. Thanks to Ron Rex for pointing out this airfield.